The Kogelberg Walk is in an area famous for its rich floral kingdom. It was South Africa’s first registered biosphere reserve. The Kogelberg Biosphere is truly a special environment. It encompasses the entire coastal area from Gordon’s Bay to the Bot River vlei, and inland to Grabouw and the Groenland Mountain. 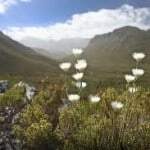 Just an hour out of Cape Town at the southern tip of Africa, lies an area of such natural beauty and floral diversity as to be recognized as perhaps world’s greatest biodiversity hot-spot. Size for size, this 100 000 hectare UNESCO registered Kogelberg Biosphere Reserve is home to the most complex biodiversity on our planet! Here we have some 1880 different plant species… the next richest is the South American rainforest with just 420 species per 10000 square kilometres! Ever changing vistas – from magnificent white beaches and wild rocky shores, sunsets over False Bay, rugged mountains rising from narrow coastal plains, to rose-edged vineyards and orchards in pockets of fertile soils in the highlands. Because of its spectacular seascapes and landscapes, and the richness of its flora and fauna, the Kogelberg Biosphere Reserve attracts people with a love of nature. Coast and river Walk along interesting rocky coast and beautiful Palmiet beach and river. 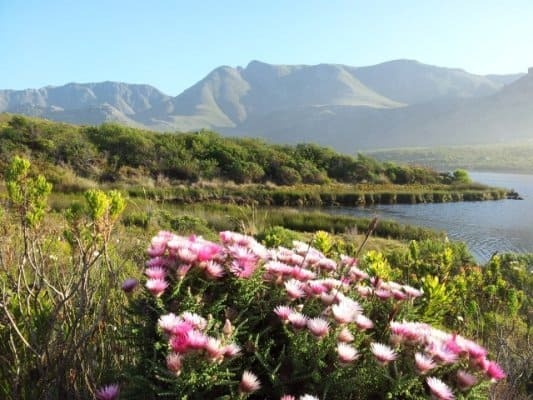 Nature Reserve Experience the beautiful Kogelberg Biosphere Reserve, a UNESCO heritage site. Discover and learn about the various indigenous plants, animals, geology and the colourful and entertaining history of the area while enjoying the breathtaking views of the coastline. Views Magnificent and unequalled views of white beaches, rocky shores and mountains. 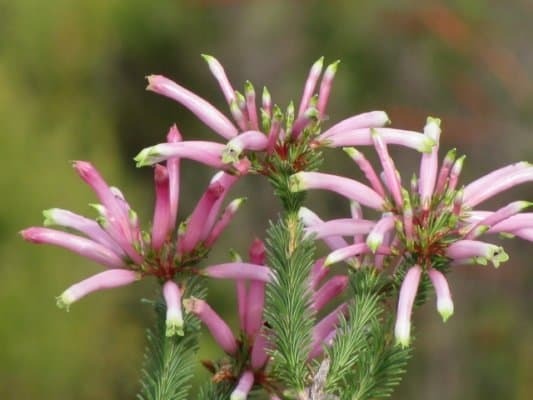 Harold Porter Botanical Garden Ten hectares of cultivated fynbos garden, and a further 190 hectares of natural fynbos. The peaceful garden includes sweeping mountain slopes, deep gorges, and unique vegetation types and some 60 species of bird. Stony Point Stony Point in Betty’s Bay is a breeding colony of African penguins. Day 1: Arrival in Kleinmond for overnight. Day 4: Spend time in Harold Porter Botanical Gardens, which showcases a variety of indigenous coastal flora. 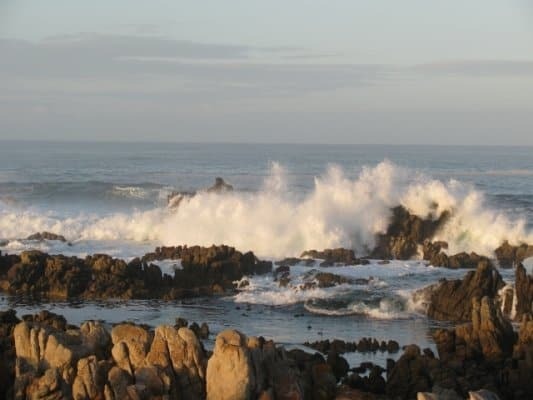 Walk the Leopard’s Gorge waterfall trail and then to Stony Point, home to one of only two mainland African Penguin Colonies, alongside the ruins of the old whaling station. Distance 10 km – Whole Day. You will stay in guesthouses in Kleinmond and Betty’s Bay. A panel of establishments have been selected to allow for non-availability. See examples of our guesthouses below. Arabella Hotel and Spa does not form part of our standard package. It is a convenient option for extension of the trip. Click on pictures to view details. 3 nights accommodation in selected guesthouses including breakfast. Transport to and from Kleinmond/Betty’s Bay, other lunches, snacks, drinks with meals. The Kogelberg area offer a range of attractions and activities that can be added to your itinerary. You can spend an additional day in the Kogelberg reserve or spend an additional day(s) at the Arabella Hotel and Spa for golf, visit the Rooisand Nature reserve, etc. Our Route Manager can assist with bookings and advice. Fly to Cape Town International airport and from Cape Town to Kleinmond by car (90 km). Transfer can be arranged, if necessary. Driving from Cape Town take the N2 towards Somerset West . After Somerset West take Sir Lowry’s Pass turnoff right and proceed until you reach Gordons Bay. Drive 4,7 km turn left on R44 ( Clarence Drive) Drive past Rooi Els, Pringle Bay,Hangklip and Betty’s Bay ( about 33 km from Gordons Bay). Kleinmond is the next town. Click on pictures for information.